"We have no idea how many – if any – other civilizations there are in our galaxy,” says Richard Conn Henry, professor of physics and astronomy at Johns Hopkins University. “One critical factor is how long a civilization – for example, our own – remains in existence. If, as we dearly hope, the answer is many millions of years, then even if civilizations are fairly rare, those in our ecliptic plane will have learned of our existence. They will know that life exists on Earth and they will have the patience to beam easily detectable radio (or optical) signals in our direction, if necessary, for millions of years in the hope, now realized, that a technological civilization will appear on Earth." Research of the past two decades have shown that literally billions of planets in the Milky Way might have niches that would support at least a level of life represented by Earth's extreomophiles. 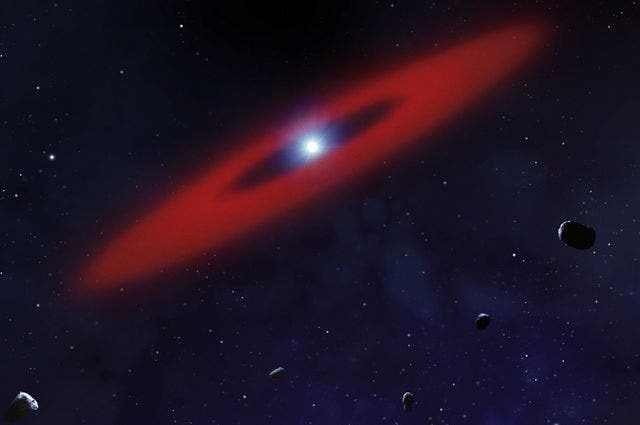 The image above shows a white-dwarf star system discovered by a UCLA-led team of scientists whose atmosphere is rich in carbon and nitrogen, as well as in oxygen and hydrogen, the components of water. The white dwarf is approximately 200 light-years from Earth and is located in the constellation Boötes. Benjamin Zuckerman, a co-author of the research and a UCLA professor of astronomy, said the white dwarf contains materials that are the basic building blocks for life. And although the study focused on this particular star — known as WD 1425+540 — the fact that its planetary system shares characteristics with our solar system strongly suggests that other planetary systems would also. “The findings indicate that some of life’s important preconditions are common in the universe,” Zuckerman said. On August 15, 1977: the night before Elvis Presley died, at 11:16 p.m. an Ohio radio telescope -a rectangular structure, larger than three football fields- called the Big Ear recorded a single pulse of radiation that seemed to come from 200 light years away, somewhere in the constellation of Sagittarius at the 1420 MHz exactly the signal ET-hunters had been instructed to look out for. The signal was so strong that it pushed the Big Ear's recording device off the chart. The Big Ear team explored every possibility: military transmissions, reflections of Earth signals off asteroids or satellites, natural emissions from stars, but nothing fit. And most odd of all, the signal came from a blank patch of sky totally devoid of stars. The young engineer's only thought was that it could have been beamed from a spaceship traveling through the universe in search of some sign of life. Big Ear was catching radio signals in a set of fifty distinct frequency channels that included some that overlapped with a special natural frequency— the frequency at which atoms of hydrogen emit radiation when their proton and electron flip between quantum spin states. This 1400 MHz or 21-centimeter line reveals the glow of interstellar and intergalactic hydrogen gas. It can also reveal the moisture content of our atmosphere and even the salinity of our oceans here on Earth when detected from space. This frequency also sits at an especially quiet spot within the galactic hubbub of radio waves, an attractive place to gather to listen for interesting phenomena that's called “the cosmic watering hole” in the electromagnetic spectrum. “6EQUJ5” signified a sudden pulse of radio energy when it appeared on Big Ear’s printout, wrote Scharf in his book, The Copernicus Complex: Our Cosmic Significance in a Universe of Planets and Probabilities. "Usually the faint signals of natural noise only rated blank spaces, or digits such as 1, 2, or 3. But if the signals got strong enough the computer would have to shift up to letters— and by the time it got to “U” it meant a signal about thirty times more powerful than the cosmic background. This pulse lasted for the duration of Big Ear’s attention span on any one spot on the sky: seventy-two seconds. It also came in at almost exactly the atomic hydrogen frequency, the cosmic watering hole. But then it was gone. And it didn’t come back— ever." The Ohio State University researchers wondered if it was man's first contact with extraterrestrial intelligence. They trained the massive scope on that part of the sky for the next month, and have returned periodically since, with no repeat of the signal. And although many point to it as a possible extraterrestrial intelligence sighting, Ehman, says told the Cleveland Pain Dealer "We should have seen it again when we looked for it 50 times. Something suggests it was an Earth-bound signal that simply got reflected off a piece of space debris." Henry and colleagues think that we limit our search for extra-terrestrial intelligence to the ecliptic plane in which our solar system's planets orbit. This ecliptic band comprises only about 3 percent of the sky, which could make it easier for scientists to effectively narrow their search for intelligent ET. The logic behind it postulates that if there is another, perhaps more advanced alien civilization in our galaxy out there; they may be trying to contact us, as well. If this is the case, Henry says a search focused on the ecliptic "should lead rapidly to the detection of other civilizations". Exoplanets in the ecliptic should be able to see Earth passing in front of the Sun. These transits are what Earth astronomers rely on to identify a variety of information about the transiting planets, such as radius, density and composition. Transits also reveal the secret’s of a planet's atmosphere, therefore any potential alien astronomers studying the Earth's spectrum would theoretically find the indicators of life in our atmospheric oxygen, letting them know—just as we long to know—that they are not alone. Henry, along with his colleagues, searches the ecliptic for these advanced alien civilizations with the Allen Telescope Array, a set of dozens of antennae in Hat Creek, California. According to Greg Laughlin, an astronomer and extrasolar planet hunter at the University of California, Santa Cruz, if there is a stargazing civilization trying to make contact with us within 50 light years, its inhabitants would see the Earth as a bluish dot. 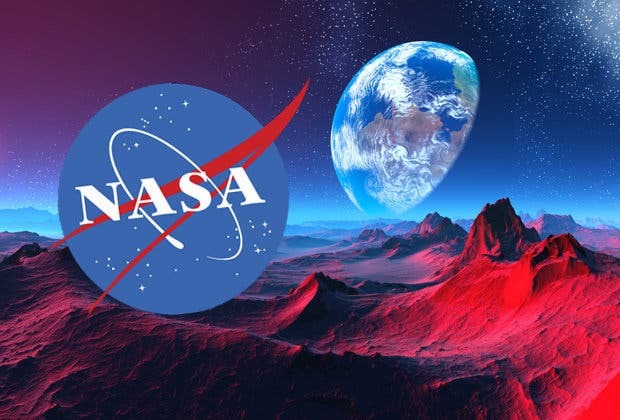 All they would need is an 8-meter space-based telescope with a good coronagraph along with a set of space-based infrared telescopes, which would enable them to detect ozone and water vapor in our atmosphere. Most of the 100 billion stars in our Milky Way galaxy are located in the galactic plane, forming another great circle around the sky. The two great circles intersect near Taurus and Sagittarius, two constellations opposite each other in the Earth's sky – areas where the search initially concentrated. The long-debated Drake Equation is of still of seminal importance because it orders our thinking. This one equation formed the backbone of astrobiology as a science. Carl Sagan was inspired that the Drake Equation showed the chances of intelligent alien life were high but he also added that extraordinary claims require extraordinary evidence. In 2010, the Italian astronomer Claudio Maccone published in the journal Acta Astronautica the Statistical Drake Equation (SDE). It is mathematically more complex and robust than the Classical Drake Equation (CDE). The SDE is based on the Central Limit Theorem, which states that given the enough number of independent random variables with finite mean and variance, those variables will be normally distributed as represented by a Gaussian or bell curve in a plot. In this way, each of the seven factors of the Drake Equation become independent positive random variables. In his paper, Maccone tested his SDE using values usually accepted by the SETI community, and the results may be good news for the “alien hunters”. We should also be open to the distinct possibility that advanced alien communications technology a billion years old may operate at the third, or perhaps even a fourth or fifth level -all of which are totally incomprehensible to the human mind at our current state of evolution.